Houses for sale in Downtown Charleston, South Carolina (29401 & 29403) has got to be one of the most gorgeous areas of the United States, and according to most historians the 2nd most historically important cities in our country. 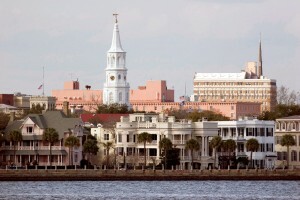 Downtown Charleston, SC real estate has a lot to offer in the way of choice. Although pricey, houses in the historic peninsula of downtown Charleston, South Carolina possess a rare charm seldom seen in most of the country. With so many options for Downtown Charleston SC homes like: harborfront houses, and waterfront condos for sale, it is key to have the right agent before you purchase a new home. Even though most of downtown is historic, a few of the most historically significant streets are, Tradd St, Limehouse, Meeting, South Battery, East Bay, The downtown Charleston real estate market consists primarily of 9 boroughs or neighborhoods: When buying an historic home there are a lot of things to consider: renovating one is not a simple quick feat, because there are very strict building codes that a specialized contractor has to know in dealing with the ARB, but if done right your home might receive the coveted Caropolis award. The Caropolis award is given when property owners take pain staking efforts to work with their contractor to preserve the historic integrity by demonstrating responsible stewardship of Charleston’s historic architecture which demonstrate a high quality of work. The historic James Macbeth House, c. 1846, and charming c. 1790 carriage house are being offered together for the first time in decades. 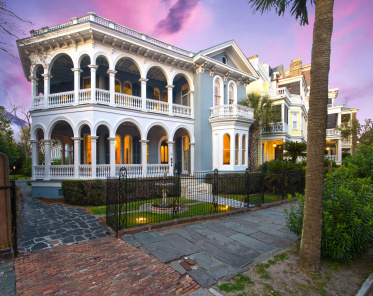 Known as one of Charleston’s finest examples of Greek Revival architecture, the exquisite South of Broad main residence embodies Southern living and hospitality at its finest…. South of Broad – Literally just as it is named this area is the most popular part of downtown Charleston, SC. Harleston Village – Located just 3 blocks of the city’s hospitals Harleston Village is also near the only lake in town. French Quarter – Very reminiscent of New Orleans for obvious reasons it is centered amongst the commerce. Ansonborough – This community is probably one of the most sought after of all the downtown Charleston homes. Radcliffeborough – In the middle of Calhoun and Morris St this borough is centrally located. Wraggborough – Is nearest to all the nightlife, dining, and entertainment of all the communities of downtown. Cannonborough and Elliottborough – The most affordable of downtown Charleston real estate, charm is still everywhere. Hampton Park – Has gorgeous homes, nature, green area, and detail in this area named after Gen. Hampton. Wagener Terrace – Just on the other side of the cross town this community is known for more modestly sized homes. Lowndes Pointe – A small little enclave of homes just at the back of the peninsula behind Westside.